On March 24, 2002, George W. Bush landed in the capital of El Salvador, on his last stop of a three-country Latin America trip. Bush met with Salvadoran President, Francisco Flores, on the very day that 22 years ago, Right-wing assassins had murdered Archbishop Oscar Arnulfo Romero. Bush was welcomed by between 10 to 15 thousand demonstrators protesting a multitude of issues ranging from Free Trade and Worker's rights, to stopping the war on Columbia, and calling for government accountability in regards to the thousands of people who were "disappeared" by Salvadoran Death Squads during the war. The huge demonstration coincided with the annual public march for Archbishop Oscar Arnulfo Romero, who has been proposed for sainthood by the local Roman Catholic Church. Romero is revered by millions for the stand he took in defense of the poor and the oppressed. According to a Reuters news report, one demonstrator named Agustin Saldana, said, "The whole visit of President Bush is trampling on this day." Reuters also reported that over 7,000 heavily armed Police and Soldiers provided security for Bush's visit. Police checkpoints restricted people from entering San Salvador from outlying provinces, so most likely the demonstration would have been even larger without the official harassment. 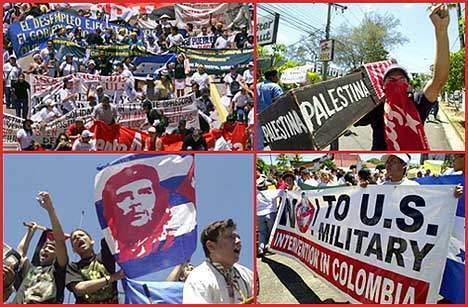 Palestine photo: (AP Photo/Luis Romero), Columbia photo: (AP Photo/Luis Romero), Che photo: (AP Photo/Luis Romero), Mass demo photo: REUTERS/Daniel LeClair.